At my day job I’m a data manager and statistician for an epidemiology project called CHAI lead by Cathryn Tonne. CHAI means “Cardio-vascular health effects of air pollution in Telangana, India” and you can find more about it in our recently published protocol paper . At my institute you could also find the PASTA and TAPAS projects so apparently epidemiologists are good at naming things, or obsessed with food… But back to CHAI! This week Sean Lopp from RStudio wrote an interesting blog post about internal packages. I liked reading it and feeling good because we do have an internal R package for CHAI! In this blog post, I’ll explain what’s in there, in the hope of maybe providing inspiration for your own internal package! 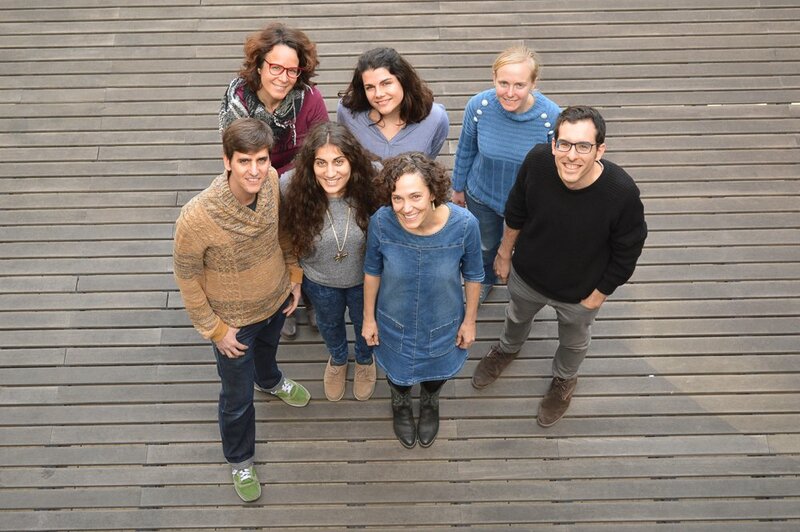 As posted in this tweet, this pic represents the Barcelona contingent of CHAI, a really nice group to work with! We have other colleagues in India obviously, but also in the US. Right from the beginning of my time here in October 2015 I had quite a lot of data to clean, which I started doing in R of course. One task in particular was parsing filenames because those were informative in our project, containing for instance a date and a participant ID. I wrote a function for that, batch_parse_filenames, which parses all filenames in a vector and returns a list composed of two data.frames: one with the information contained in the filename (e.g. participant ID, date of sampling) and one with possible parsing mistakes (e.g. a nonexistent ID) and an informative message. It was a very useful function, and I packaged it up together with the data containing the participant IDs for instance. This was the beginning of an internal package! I decided to call it chaimagic because it sounded cool, and this despite knowing that there’s absolutely no magic in the code I write. chaimagic evolved with helper functions for analysis, e.g. a function returning the season in India from a date (e.g. monsoon, winter), or functions for common operations on variables from our questionnaire data. chaimagic also got one more contributor. chaimagic also contains a Shiny dashboard for exploring personal monitoring data that were collected in the project: one selects a participant-day and gets interactive leaflet and rbokeh plots of GPS, air quality, and time-activity data from questionnaires and wearable cameras. I told my boss that the dashboard was brought to us by the biblical Magi but maybe I helped them, who knows. Now, our package also supports scientific communication thanks to an RMarkdown template for internal reports which fostered reproducibility of analyses by making the use of RMarkdown even more appealing. Having an RMarkdown template also supports consistent branding, which is discussed in the RStudio blog post. chaimagic also includes a function returning affiliation information for any possible collaborator we have; and a function returning the agreed-upon acknowledgement sentences to be put in each manuscript. These are pieces of information we can be very happy not to have to go look for in a folder somewhere, we can get them right without leaving R! Why is chaimagic a really cool package? chaimagic has been a valuable tool for the work of two statisticians/data managers, one GIS technician, one post-doc and one PhD student. Discussing its development and using it was an occasion to share our R joy, thus fostering best practices in scientific computing in our project. Why use Stata or other statistical softwares when you have such a nice internal R package? We found that even if our package served a small team of users, an R package provided a robust infrastructure to ensure that everyone was using the same code and R coding best practices in our team. So this is very good… but we all know from e.g. Airbnb (see also this post about Airbnb and R) that stickers are a very important aspect of an internal R package. 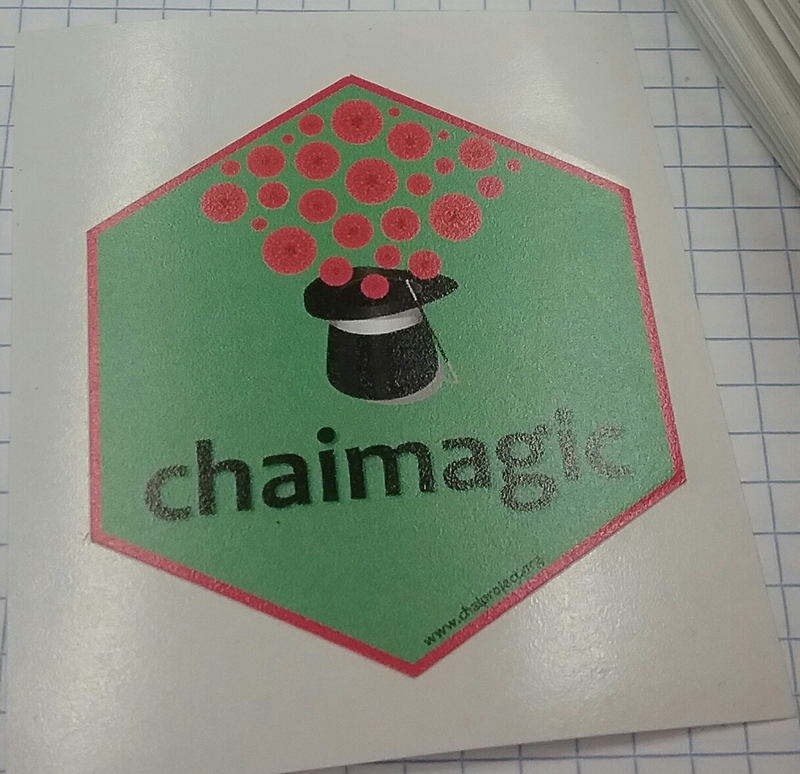 I was over the moon when my colleague Carles handed me these fantastic chaimagic stickers! He used the hexSticker package. I’ll leave the team in September after everyone’s vacations, and this piece of art was the goodbye present I received at my goodbye lunch. Doesn’t it make our internal package completely cool now?